In what’s considered the largest mass stranding in decades, over 400 pilot whales have beached themselves on a New Zealand shore. Hundreds of whales died overnight, and rescuers are now frantically working to save the dozens of remaining whales who are clinging to life. 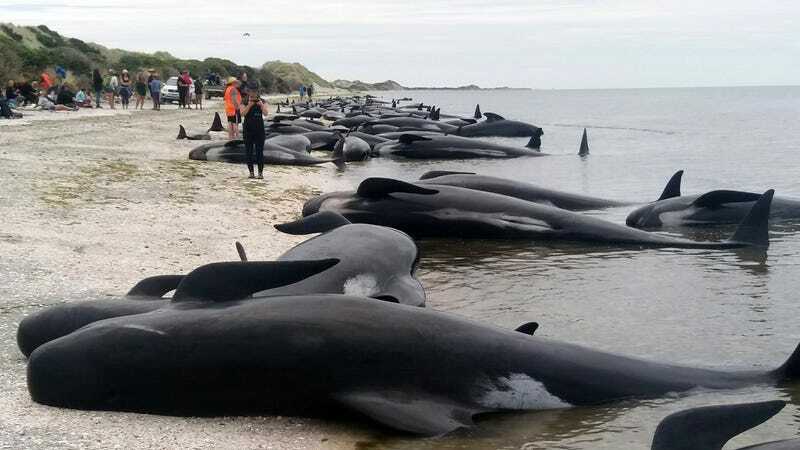 According to New Zealand’s Department of Conservation (DOC), 416 pilot whales had beached themselves at Farewell Spit in Golden Bay, at the northern tip of the country’s south island. When the DOC arrived on the scene, around 250 to 300 whales had already perished, and by the time dawn broke this morning, more than 70 percent of the whales were dead. DOC staff and dozens of volunteers are now trying to save the remaining 80 to 90 whales. For those trying to help, the sight must be truly horrific. Images from the scene show the beach littered with the large black-bodied corpses. The ones still alive are surrounded by rescue workers who are desperately trying to keep them cool, wet and and calm. “It is one of the saddest things I have seen, that many sentient creatures just wasted on the beach,” noted volunteer rescuer Peter Wiles in The Guardian. The DOC has made a plea to the local community to come and help, and to provide towels, buckets, and sheets. Some rescuers have been working in the cold, wet conditions for upwards of nine hours straight. The response was incredible, and the DOC says no more volunteers are needed at this time. The next opportunity to save the remaining whales is scheduled for noon tomorrow (Saturday) when the tide comes in. Frustratingly, the remaining whales were “refloated” at high tide earlier today (at about 10:30 am local time), but 90 of them came back and re-beached themselves. As social mammals, they were likely trying to stay close to their pod—the majority of which are now lying dead on the beach. New Zealand has one of the highest rates of whale strandings in the world; about 300 whales and dolphins beach themselves on the nation’s shorelines each year. Golden Bay is particularly conducive to strandings because of its shallow topography, which makes it difficult for whales to swim out once they’ve entered. On top of that, pilot whales are notorious for stranding themselves. Entire groups of these whales will beach themselves on account of their strong social bonds. It’s possible that the whales got stuck when an old, sick, or injured whale got stranded, and its pod-mates swam to its aid. The stranding may also have something to do with the pilot whales’ compromised ability to use echo-location in shallow, gently sloping waters. These whales, which are the largest of the oceanic dolphins, prefer steep areas such as continental shelf edges. Farewell Spit, with its shallow waters, is a death trap. 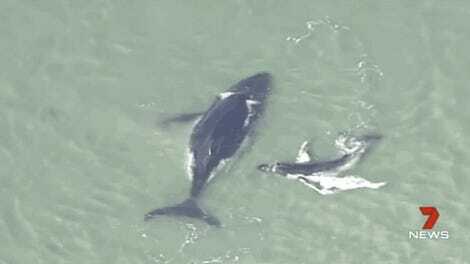 This stranding is now considered the third largest in New Zealand’s recorded history. In 1918, over a thousand whales beached themselves on the Chatham Islands, and in 1985, 450 stranded themselves at Great Barrier Island off the coast of Auckland. Two years ago, 200 whales were killed in a mass stranding at Farewell Spit.